This release represents the first phase of Ensaaf’s Punjab-wide census, consisting of over 40 variables per case, covering victim demographics, incident information, identity of the perpetrators, and outcomes desired by survivors, among other topics. Users can filter victim profiles in both the gallery view and the map view according to various variables to identify subsets of victims and explore patterns of gross human rights violations. Further, keywords within individual victim profiles lead to pages listing other cases sharing the same information, whether it is the identity of the perpetrator, or the village of the victim, among many other intersections. Support the next phase of this project as we collect more information on perpetrators, add 5000+ narratives, and release over 200 videos. Read more about what is forthcoming. The government of India has an ever-present obligation to the survivors and communities impacted by these gross human rights violations. It must end the cruelty inflicted on families of the disappeared and tell them the truth about the fate of their disappeared loved ones and those they murdered, and further provide them with justice and reparations. This site serves as a definitive resource to rebut state denials and justifications for the widespread and systematic abuses. 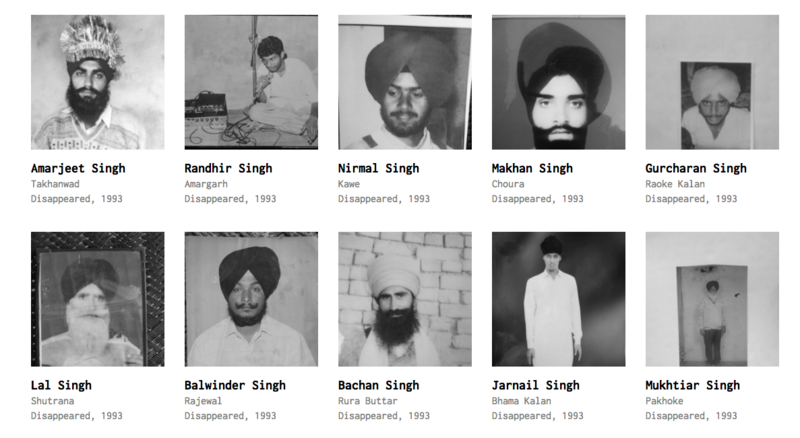 It equips the international community to readily build consensus on the true scale and scope of the crimes committed in Punjab—nothing short of crimes against humanity.